On the 28th of September 2018 the Macaronesia, represented by the islands of Tenerife, Gran Canaria, Madeira and São Miguel, experienced a tsunami of researchers taking the streets and showing the islands that they, too, have a scientific identity, that their place of birth is full of richness to be discovered and that science has played a fundamental role in their history, from conquest times to today. Leading this invasion of science is La Palma Research Centre as coordinator, with a consortium including Universidad de La Laguna, Fundo Regional para a Ciência e Tecnologia, Fundación Canaria del Parque Científico Técnico de Las Palmas, Universidade da Madeira and Instituto Astrofísico de Canarias. For 2019 the Universidade do Mindelo, from Cape Verde, will join for an even bigger event. 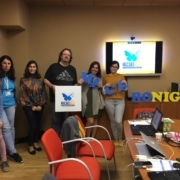 MacaroNight is a Marie Curie Researcher’s Night two-year project, aiming to dispel stereotypes about researchers and raise awareness to the importance of science in the Macaronesia. A final objective is to encourage the next generation of Macaronesian researchers to take up a career in STEM – Science Technology Engineering and Mathematics. Also, the project has been awarded the European Year of Cultural Heritage stamp, thanks to its numerous activities highlighting the Macaronesian common heritage. In order to reach the goals of the project the consortium puts together a series of events including demonstrations, hands-on experiments, tours and other interactive activities designed with and for the public to submerge the attendants in the world of research. Don’t forget to come and see us on the 27th of September 2019! La Palma Research is proud to announce the launch of MacaroNight!